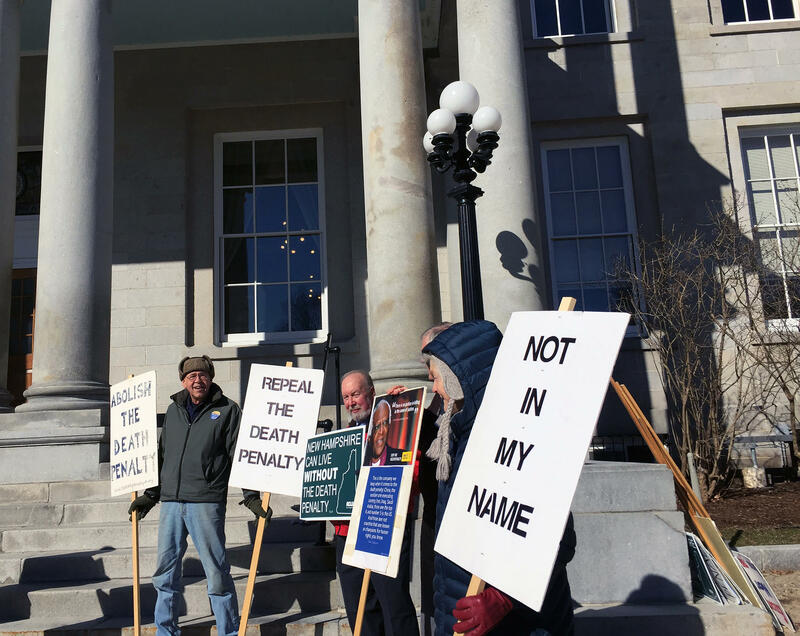 Opponents of the death penalty greeted lawmakers Thursday morning outside the N.H. State House. Gov. Chris Sununu has promised to veto the bill. He vetoed a similar bill last year. If the vote margins hold, the House and Senate have the votes to override a veto. New Hampshire has not executed anyone since 1939. There is one person on death row in the state: Michael K. Addison, who was convicted for killing Manchester Police Officer Michael L. Briggs in 2006. Laura Briggs, his widow, testified last month against the bill. She said, "It's not about an eye for an eye or revenge ... it's about protecting our society from evil people that do evil things." The bill would change the penalty to life imprisonment without the possibility of parole. As drafted, the repeal of New Hampshire's death penalty would not apply to Addison. Prior to the vote, Democratic Sen. Martha Hennessy urged her colleagues to keep their resolve. "It is time to abolish the death penalty in New Hampshire—now," she said. Today the New Hampshire House of Representatives voted 279 to 88 in favor of repealing the state’s death penalty. Lawmakers have voted on this issue many times in the past few years. It’s been vetoed by governors before, and it’s expected that Governor Sununu will veto it again this year. The New Hampshire Senate failed to override Gov. Chris Sununu’s veto of a death penalty repeal bill on Thursday. As it did during the session, the Senate voted 14-10 in favor of repeal, which fell short of the two-thirds majority needed to overturn the veto. The House and Senate both passed Senate Bill 593 repealing the use of the death penalty this session, but Sununu called it the “ultimate legal deterrent” and an important way to deliver justice for victims of crime.